Malabar, a southern coastline nestled between Arabian Sea and Western Ghats, is lined with a string of coconut trees. Hence, the flavour of coconut predominates over the Malabar cuisines. Originally, any authentic Malabari dish is cooked with coconut oil. 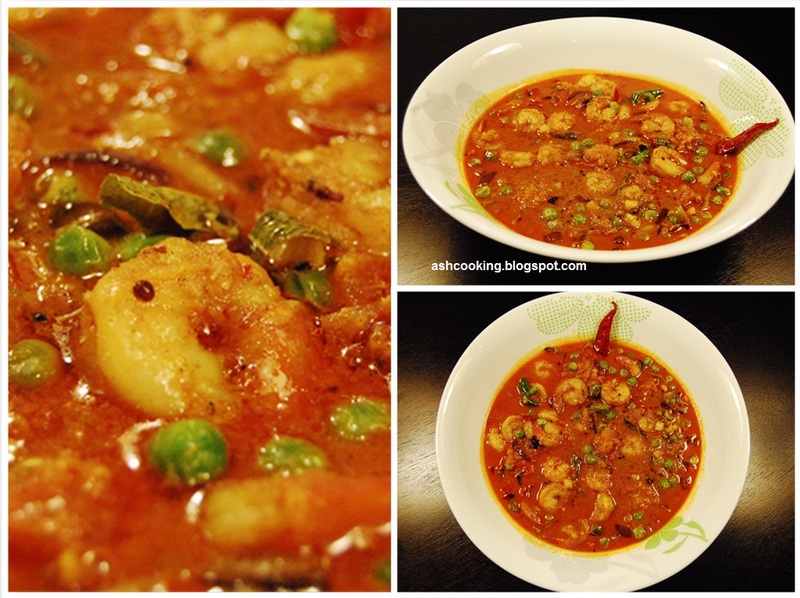 I have learned this recipe of Malabari Prawn curry from a cookery show hosted by Aditya Bal. Bal hewed to the authenticity of Malabar cuisine by cooking it in coconut oil. You may do the same if you like. But since I don't like the over pervasive smell of coconut oil, I have replicated the dish using white oil. 1) Marinate the prawns with a pinch of turmeric powder, kashmiri red mirch, salt and 1 tsp of oil. Then in smoking hot oil, shallow fry them till golden orange in color. 2) For Dry Masala Paste, dry roast the ingredients mentioned in a skillet on high heat for couple of minutes and then grind them into fine paste. 3) Once the prawns are fried, take them off the flame and keep aside. Now into the same wok, add 2 tbsp of oil and when turns piping hot, add dry red chillies and black mustard seeds. Allow them to crackle. 4) One after another, add chopped ginger, garlic and onion. Fry them till translucent in color. 5) Add turmeric powder, kashmiri red mirch, green chillies and the ground dry masala paste. Saute for couple of minutes adding water in small measure. 6) When the spices are well incorporated with the oil floating on the surface, add coconut milk little by little. 7) Add salt, tamarind extract, curry leaves and tomatoes. Cook the gravy on medium heat for another couple of minutes. 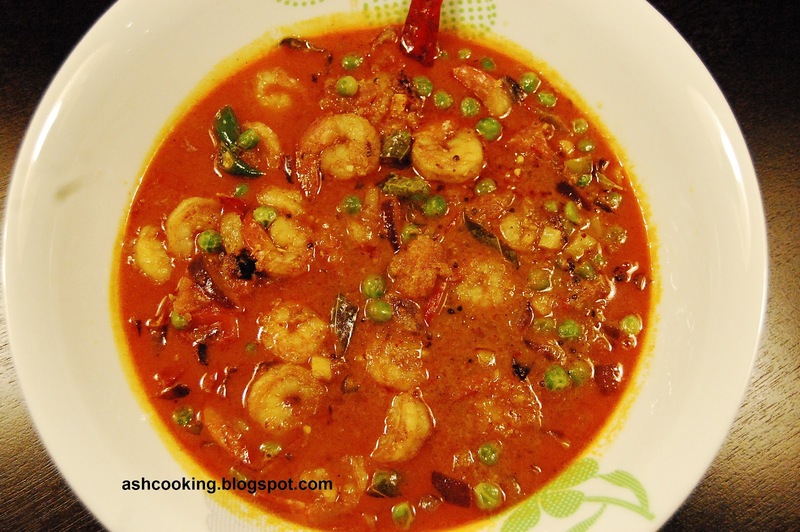 8) Then add green peas, jaggery and the fried prawns. Cook covered till prawns are tender. 9) Serve hot with rice or pilaf. All the content and photos used in this blog are copyrighted to ashcooking.blogspot.com.. Powered by Blogger.